Enjoy Life is one of the most prominent food brands designed for people with food allergies. Its products are free of the 8 most common allergens (wheat, milk, egg, soy, peanuts, tree nuts, fish, shellfish). They are also gluten-free and contain no genetically modified organisms (non-GMO). Get Allergy Wise was recently invited by Enjoy Life to try out their 100% Natural Decadence Bars, the company's newest line of allergy-friendly snacks. These soft-baked bars come in boxes of five, perfect for sampling among Get Allergy Wise's collective brood of five kids. The Natural Decadence bars are made in a dedicated facility that uses none of the top 8 allergens. Most of Enjoy Life products are made in dedicated top-8 allergen-free facilities though you should double check your ingredient label (we always do anyway, right?) for specifics. I say this because in the process of contacting Enjoy Life reps to verify the "freeness" of the bar-making facility, I was surprised to learn that the company's Plentils chips are made in a facility that also produces containing dairy. The Plentils are made on a dedicated dairy-free line in a separate area of the facility but milk is handled elsewhere within the same facility. I appreciated getting a prompt explanation from one of EJ's reps. Batches of Enjoy Life products regularly go through testing for allergens to ensure that cross contamination has occurred. How did the bars taste? Did you like the flavor? T: They were very chocolaty and melty. The flavor was kinda too sweet for me. R: They were sweet. It was good and bad at the same time. It was too sweet on some parts, and just right on others. A: A little salty and sweet. I liked them. C: I liked it because the taste. The taste means chocolate! L: It's too good for me. I like it very much! What was the texture like? T: It was sticky and they were very hard to chew. R: It was bumpy and rough. Where would you eat them? T: Somewhere very cold like Antarctica because I didn't like the chocolate melting. T: At night because it is very cold and I like cold weather. A: When would I eat what? [The Sunbutter bars we were just talking about] Oh, lunch. How do they compare to other snacks or bars you've eaten? T: Compared to fruit, I didn't really like them. R: Compared to Trader Joe's crunchy oats and honey granola bars (Irene's kids love these), I like the Enjoy Life ones. They are 50/50 (meaning he likes them equally). T: I would tell some of my friends that are allergic to nuts that they might like it instead of having something else for a snack for lunch, breakfast, or a dessert at anytime. R: Yes, cause they are very good. 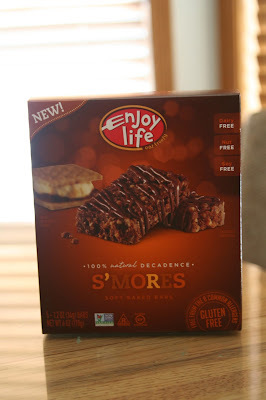 How does this S'mores bar taste compared to the Chocolate Sunbutter flavor? L: I think I like the S'mores one more than the Sunbutter one because it's more chocolaty and I like chocolate. T: I like this one better. It tastes less chocolaty. R: It tastes like chocolate. I like it better, but both are good. C: Good. It's crunchy. It's less chocolaty (than chocolate sunbutter bar). It feels better. The taste -- it feels better than the sunbutter bar. Does it taste like a real (dairy-free) S'mores that you've had at camping? C: Well, yes, it tastes a little bit like it. It tastes like the graham cracker part. It tastes pretty much like the marshmallow part. Do you prefer the S'mores flavor, Chocolate Sunbutter flavor, or another type of bar? C: I like the S'mores. If we went to a birthday party, let's say I didn't bring you a safe cupcake. How would you feel about eating one of these instead? C: Good! I would eat it. 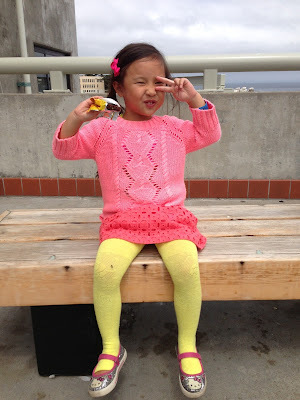 Irene also had a chance to sample the cinnamon bun flavor. She liked the soft texture and the fact that there was no chocolate that might quickly melt all over her hands. (Really, she's more concerned about chocolate all over her active boys' hands!) While it didn't have the burst of cinnamon that one might expect from its name, the cinnamon bun bar was still tasty. It had the most natural taste and reminded her of apple cinnamon oatmeal. Although it contains slightly less sugar (11 grams per bar), the cinnamon bun bar didn't taste as sweet to her as the S'mores had. The S'mores was a little too sweet for the grownups but the kids sure liked them! My biggest hope for Enjoy Life bars is that they can find a way to fortify them with more vitamins, fiber, or protein without sacrificing their commitment to being safe of the top allergens. I would love to see allergy-friendly bars that have the nutritional powerhouse of an energy bar! Until then, our family will add Enjoy Life Natural Decadence Bars to the list of safe special treats to share with our other friends with food allergies or when I can't make a safe dessert myself. Interesting. I love how kids are blunt and honest. New England Allergy in North Andover, MA specializes in pediatric allergy relief. Visit their site at www.newenglandallergy.com.